College education represents a significant investment in your future and cost is an important factor to consider. 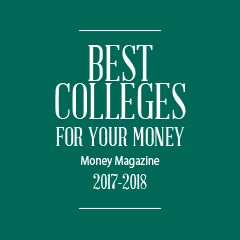 Mercyhurst University prides itself on being one of the most affordable and accessible private universities in the tri-state region and practically every incoming freshman receives financial aid in the form of scholarships, grants, work studies and other programs. Mercyhurst University bills students on a “flat” basis for each semester enrolled; full-time students enrolled between 12 and 18 credit hours are billed at the flat semester rate, allowing for a double major or a minor. Enrollment beyond 18 credits is billed at $1,150 per overload credit hour. Additional costs may be incurred for special programs, courses, labs, travel experiences, etc. Please refer to our Full Fee Schedule for more information. Room and board costs vary, depending on the student’s selected living and dining arrangements. Resident freshmen are required to have a full meal plan. Partial meal plans for upperclassmen begin at $2,560. You may want to consider indirect costs in your college financial planning for things like books and supplies, transportation and personal expenses. When considering financial aid, it is important to keep in mind the “sticker cost” and “actual cost” of each institution. 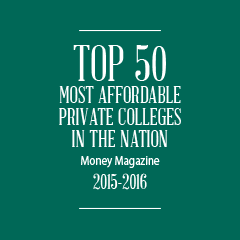 At Mercyhurst, we are committed to helping students reach their academic goals without incurring significant financial burden. 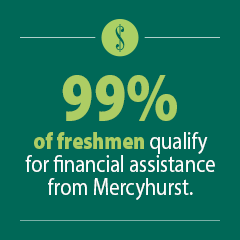 Last year, 99 percent of freshmen qualified for financial assistance from Mercyhurst, with the average four-year scholarship totaling more than $70,000 – and that is in addition to any scholarship or grant from state federal or external sources. Please refer to our Federal and State Grants page for more information. Transfer students are also eligible for a number of awards or scholarships. Unless otherwise noted, all Mercyhurst University financial aid is automatically renewable for four years of study. Please refer to our Awards and Scholarships page for a complete list of available grants. In order to qualify for financial aid, you must include Mercyhurst University on your Free Application for Federal Student Aid (FAFSA®). Use school code 003297 to send your FAFSA® report to Mercyhurst. To apply for financial aid, please complete the Free Application for Federal Student Aid. Start earning scholarships with RaiseMe while you’re in high school.